You’ll need 1 small box of jello in each color (red, orange, yellow, green, blue, purple). 1 large container of cool whip (you may use sour cream or yogurt in place of the cool whip). Chose the color you want on the bottom (in this case purple). Dissolve jello as directed on the box using the “quick chill” method (which includes some ice). Once dissolved, pour the liquid into your glasses, reserving about 1/3 of the jello liquid. Put all of the glasses in the refrigerator for 15-30 minutes, until jello is slightly set. Mix about 1/3 cup cool whip (sour cream or yogurt) into the remaining jello liquid. Pour cool whip/jello mixture on top of partially set first layer. Place all cups in the refrigerator and allow to set (at least 15-30 minutes) while you mix the next color. Repeat process with each color, allowing each layer to set 15-30 minutes before adding another layer. The total process will take several hours. Top the finished rainbow jello with a dollop of cool whip, or whipped cream and add a chocolate gold coin. Mix Ice Cream, Stout, Dash of Luck for his Saint Patrick's Day. 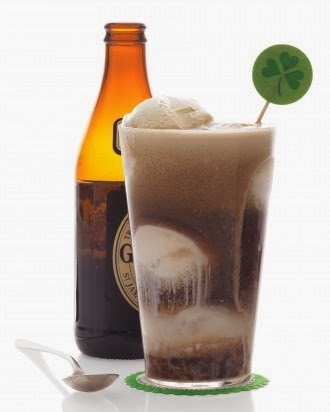 Enjoy a cocktail version of a root beer float: vanilla ice cream topped with Irish stout. With the ice cream sweetening the rich beer, the float is as much a dessert as it is a drink. Scoop ice cream into a pint glass, and pour in enough stout to fill it. One pint of ice cream and one 12-ounce bottle of beer will yield 2 servings. 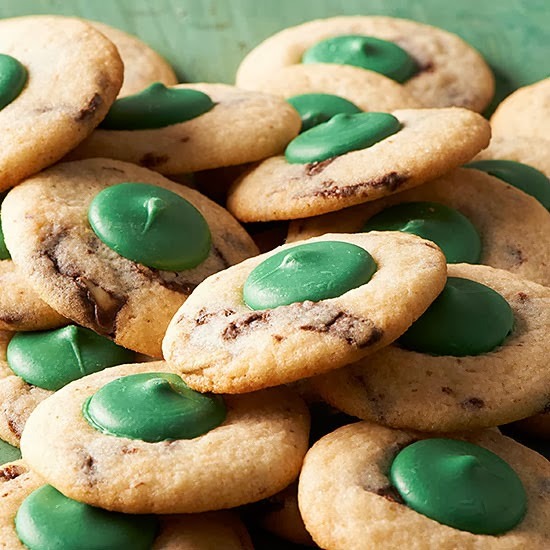 Dig out that box of plain sugar cookie mix hiding in your pantry and give it an Irish makeover. 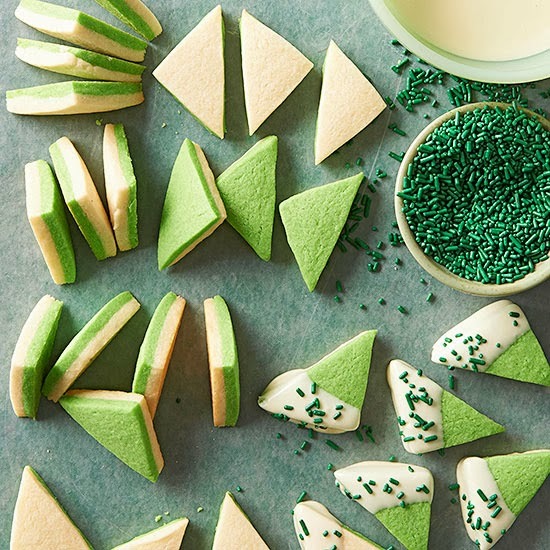 Mint-flavor chocolates and emerald-green candy toppers add charming St. Patrick's Day appeal. Preheat oven to 350 degrees F. Line a large cookie sheet with parchment paper; set aside. In a large bowl stir together cookie mix, butter, egg, and mint extract until a soft dough forms. Stir in chopped chocolate-mint candies. Drop dough by rounded teaspoons 2 inches apart onto the prepared cookie sheet. Bake for 8 to 10 minutes or until set. Place a coating disk on top of each cookie. Cool cookies on cookie sheet for 1 minute. Transfer to a wire rack; cool. Look for green candy coating disks or wafers in the cake decorating section of hobby and craft stores, the most common brand being Wilton. Preheat oven to 350 degrees. Make the cupcakes: Whisk together flour, baking powder, baking soda, and salt. Pour water over espresso powder; let cool. Combine espresso with milk. Beat butter and granulated and brown sugars with a mixer on medium speed until pale and fluffy, about 3 minutes. Add eggs, 1 at a time, beating well after each addition. Beat in flour mixture in 3 additions, alternating with espresso-milk mixture, beginning and ending with flour (batter may look broken). Fill 15 cups (of two 12-cup muffin tins) three-quarters full. Bake until a toothpick inserted into the centers comes out clean, 20 to 22 minutes. Let cool; turn out cupcakes from tins. Make the frosting: Whisk together cream and confectioners' sugar until medium peaks form. Add whiskey; whisk until slightly stiff peaks form. 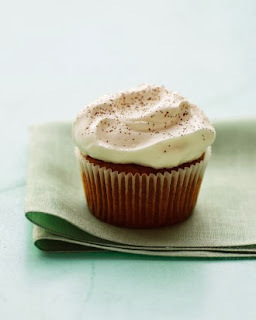 Top each cupcake with 2 tablespoons frosting; dust with espresso powder. 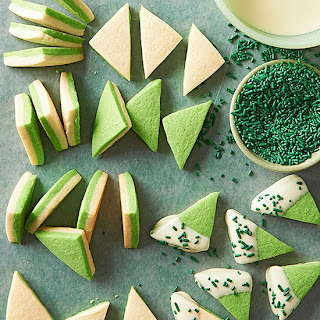 Do a little boozy baking this St. Patrick's Day. Whip some creme de menthe -- a mint-flavor liqueur -- into both your batter and green frosting for darling brownie bites that crumble with cool flavor. Preheat oven to 350 degrees. 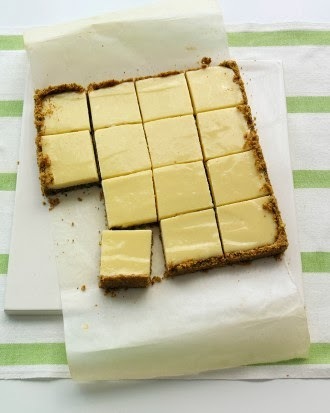 Brush an 8-inch square baking dish with melted butter. Line bottom with parchment paper, leaving a 2-inch overhang on two sides. In a food processor, finely grind pistachios with graham-cracker crumbs, sugar, and zest. Blend in butter. Press mixture into bottom and 1 inch up sides of prepared pan. Bake until lightly browned, 8 to 12 minutes. Cool crust, 30 minutes. To make the filling: In a large bowl, whisk together egg yolks and condensed milk. Add lime juice; whisk until smooth. Pour filling into cooled crust; carefully spread to edges. Bake until set, about 15 minutes. Cool in pan on rack; then chill at least 1 hour before serving. Using parchment paper overhang, lift out of pan, and transfer to a cutting board. With a serrated knife, cut into 16 squares, wiping knife with a damp kitchen towel between each cut. 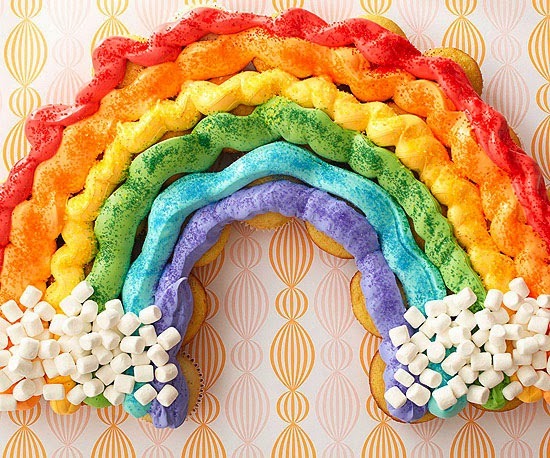 With this dazzling array of cupcakes, you can finally see what's at the end of the rainbow. 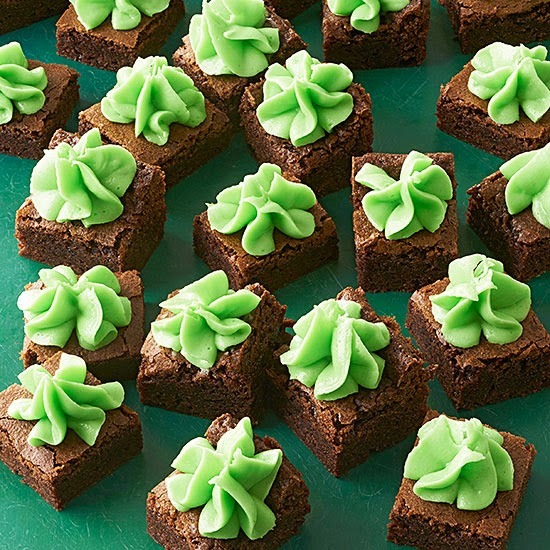 Bring yourself luck on St. Patrick's Day with this easy-to-make treat -- all you need is around 30 cupcakes, creamy white frosting, food coloring, and mini marshmallows. Divide Creamy White Frosting into six portions. 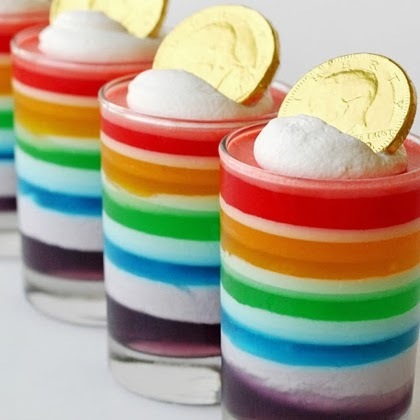 * Tint each portion a different color with food coloring. Place each color in a disposable pastry bag or heavy resealable plastic bag. On a very large serving platter arrange cupcakes tightly together in a rainbow shape; use 6 to 8 cupcakes for the inside row, 8 to 10 cupcakes for the middle row, and 12 to 14 cupcakes for the outside row. Snip off the tip of each pastry bag or one corner of each plastic bag. Pipe rows of colored frosting onto tops of cupcakes to make a large rainbow. If desired, use a narrow metal spatula to gently spread frosting to fill in gaps. Sprinkle matching sugars over colored frostings. Sprinkle marshmallows over frosting at each end of the rainbow to resemble clouds. Makes 26 to 32 (2-1/2-inch) cupcakes. Irish coffee is the perfect finale to a St. Patrick's Day feast, espeically since it can still be chilly outside. 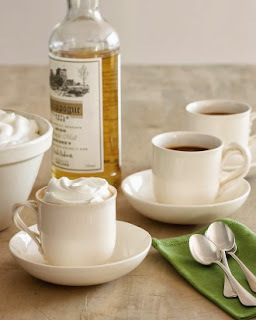 For this treat you will need 1 cup heavy cream, 1/4 cup sugar, 3 cups strong hot coffee, and 4 ounces Irish whiskey, such as Knappogue Castle. Whisk cream and sugar together in a medium bowl until stiff peaks form. Divide coffee and whiskey among 4 coffee cups, then top each with 1/2 cup whipped cream. Serve immediately. In a large mixing bowl beat butter with an electric mixer on medium to high speed for 30 seconds. Add granulated sugar, baking powder, and salt. Beat until combined, scraping sides of bowl occasionally. Beat in egg and vanilla until combined. Beat in as much of the flour as you can with the mixer. Using a wooden spoon, stir in any remaining flour. Divide dough in half. Leave one portion plain. Stir mint extract into remaining portion and add enough food coloring to tint dough desired shade of green. Divide each portion of dough in half. Cover and chill about 1 hour or until dough is easy to handle. Preheat oven to 375 degrees F. On waxed paper, roll a plain portion of dough into a 9x6-inch rectangle. On a floured surface, roll a green portion into a 9x6-inch rectangle. Use wax paper to invert plain dough rectangle on top of the green dough rectangle; peel off waxed paper. If necessary, press edges to align them. Cut each stacked rectangle into twenty-four 1 1/2-inch squares. Cut each square in half diagonally to make 48 triangles. Repeat with remaining dough portions. * Place triangles 1 inch apart on an ungreased cookie sheet. Bake for 7 to 8 minutes or until edges are firm and bottoms are light brown. Transfer cookies to wire racks; cool. In a small saucepan cook and stir white chocolate and shortening over low heat until melted. Dip half of each cookie into the white chocolate mixture, allowing excess to drip back into saucepan. Place cookies on trays lined with waxed paper. If desired, sprinkle dipped portions with jimmies. Chill until white chocolate is set. Forget tea party celebrations and host a St. Patrick's Day ice cream social instead. 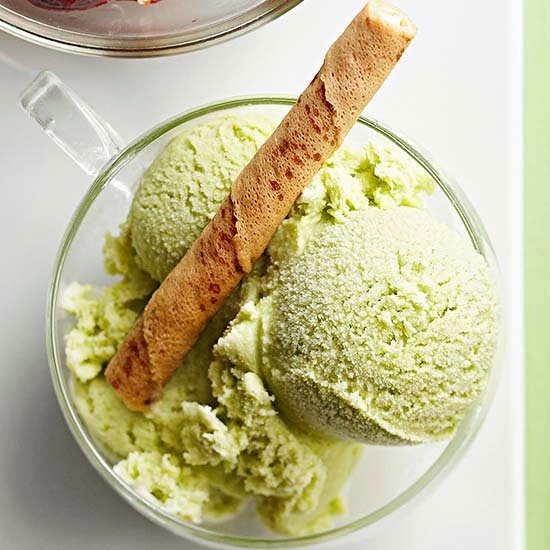 Turn natural green tea into chilly scoops of ice cream, then garnish each bowlful with creme-filled wafer cookies.